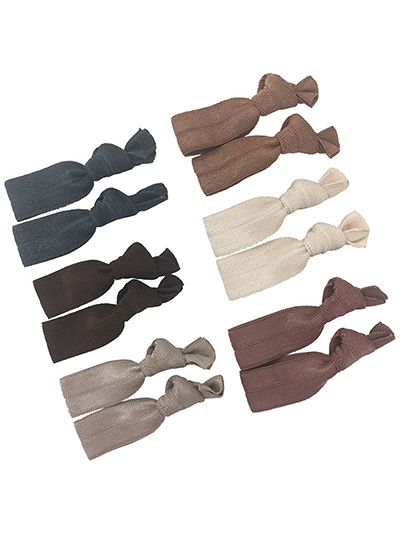 Cyndibands Minis set of 12 neutral color small sized hair ties. Cyndibands minis are shrunken size versions of our standard gentle hair ties made especially for babies, kids and braids. The elastic for these hair ties is our softest and most stretchy so it is perfect for little girls and strong enough to secure braids. These hair ties are 2 inches shorter than our regular hair ties and generally will tie around 3 times on braids and small ponytails measuring up to one-half of an inch. These are my toddler’s favorite hair bands. She loves how they look like tiny ribbons and don’t pull her hair at all. As a mom, I love how easy they are to get in and out of her hair. And don’t even get me started on the amazing color selections. They all look beautiful in her hair and now I need to get some for myself!! !